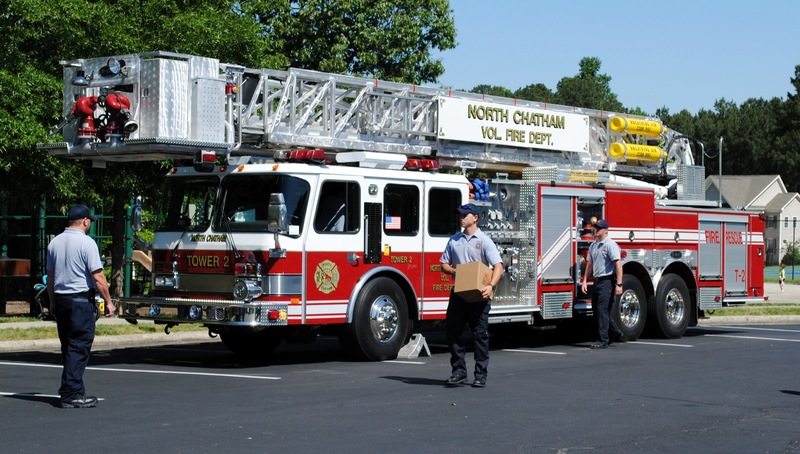 The Governors Village 9th Annual Firemen’s 5K Race & Pancake Breakfast was held on Saturday, May 17, 2014. The weather was cool, the sun was shining and all in all, it was a great day for a race. Whether you ran or watched, it was fun. Most of the runners had broad smiles as they crossed the finish line. Perhaps this was to celebrate their accomplishment or maybe the prospect of a Pancake Breakfast. Whichever it was, we leave to you to discover. Each runner was greeted with cheers and applause as they completed the race. Each participant was presented with a collectors t-shirt. Shortly after the last runner completed the circuit, runners and non-runners were treated to a Pancake Breakfast prepared by our own Social Committee and served by the Firemen and Firewomen of the North Chatham Fire Department. Also on hand was a full size mascot named Sparky. Sparky encouraged the runners and spoke with the children to give them more of an awareness of what to do in case of fire. These firefighters showed their lighter side when they posed for a group photo. Following the Pancake Breakfast, the Kids Triathlon started. The participants were to run around the tennis court, bicycle around a course and lastly dive into the pool to swim. After they were grouped according to ages, they were off to the races. To their credit, no one showed the slightest hesitation to leap into the pool and complete the race. After everyone finished, prizes were awarded and everyone either stayed at the pool or left to begin any remaining Saturday activities. The Communications Committee thanks Social Committee member Shannon Leslie for alerting us to a couple of photo ops that would otherwise have been missed. We must all thank Janie Bailey, Chair and all the Social Committee members and volunteers for doing so well with the challenging tasks of planning and completing this event. I think we all agree that it was a great success. The pictures will further describe this special day. Enjoy! This entry was posted in gv Events and tagged gv Firemen's Pancake Breakfast on May 21, 2014 by James.